36 | TH E M R EP O RT O R I G I NAT I O N S E R V I C I N G A NA LY T I C S S E C O N DA R Y M A R K E T ORIGINATION THE LATEST Banks Have 3 Priorities OCC sees compliance, operational resilience, and credit risk management as key objectives. T he Office of the Comptroller of the Cur- rency (OCC) released an operating plan in May that outlined key objectives banks need to focus on for the remainder of the year. The OCC's Committee on Bank Supervision developed the plan, or the Fiscal Year 2016 Mid-Cycle Operating Plan Status Report, that sets forth the agency's broad supervision priori - ties and objectives. The agency's fiscal year began on October 1, 2015, and concludes September 30, 2016. "The OCC's operating plan creates the foundation for developing individual bank supervisory strategies and policy initiatives," Senior Deputy Comptroller for Bank Supervision Policy and Chief National Bank Examiner Grace Dailey said. "Publishing those results promotes transparency and frames our expectations of na - tional banks and federal savings associations going forward." The agency noted that these strategies are "designed to priori- tize risks, achieve supervisory ob- jectives, and effectively use OCC resources." Typically, large bank supervision objectives are similar to midsize and community bank supervision, but strategies depend on the size of the financial institu - tion, complexity, and risk profile. According to the OCC's plan, here are a few of the supervisory priorities for banks: 1. Compliance OCC staff will also continue to assess the bank's effectiveness in complying with consumer laws, regulations, and guidance, which includes the Truth in Lending Act and the Real Estate Settlement Procedures Act Integrated Disclosures Rule requirements and preparation for implementa - tion of the Military Lending Act. 2. Operational Resilience OCC supervisory staff will review the bank's adequacy of operational resiliency to informa- tion security risks, cybersecurity threats, and third-party relation- ship risk management. Supervisory staff should continue to implement the Federal Financial Institutions Examination Council's Cybersecurity Assessment Tool. 3. Credit Risk Management OCC supervisory staff will evaluate credit risk management, particularly concentration risk management, credit underwriting practices, loan growth strategies, quality of loan policies, allowance for loan and lease losses method - ology, and stress testing. "The OCC will continue to adjust supervisory strategies as appropriate, given meaning - ful changes in emerging risks and supervisory priorities," the report said. 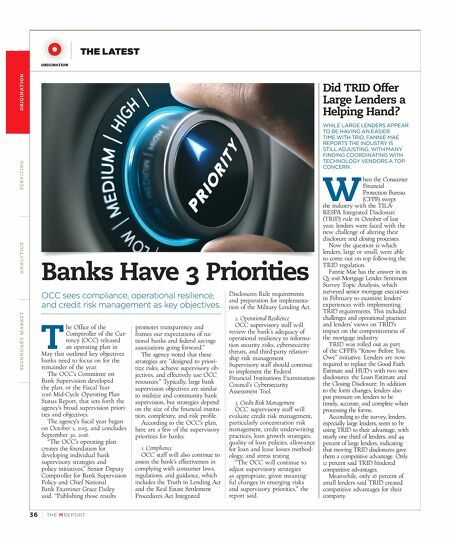 Did TRID Offer Large Lenders a Helping Hand? WHILE LARGE LENDERS APPEAR TO BE HAVING AN EASIER TIME WITH TRID, FANNIE MAE REPORTS THE INDUSTRY IS STILL ADJUSTING, WITH MANY FINDING COORDINATING WITH TECHNOLOGY VENDORS A TOP CONCERN. W hen the Consumer Financial Protection Bureau (CFPB) swept the industry with the TILA- RESPA Integrated Disclosure (TRID) rule in October of last year, lenders were faced with the new challenge of altering their disclosure and closing processes. 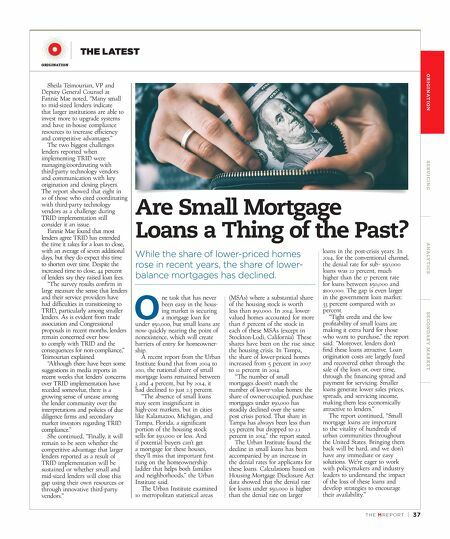 Now the question is which lenders, large or small, were able to come out on top following the TRID regulation. Fannie Mae has the answer in its Q1 2016 Mortgage Lender Sentiment Survey Topic Analysis, which surveyed senior mortgage executives in February to examine lenders' experiences with implementing TRID requirements. This included challenges and operational practices and lenders' views on TRID's impact on the competitiveness of the mortgage industry. TRID was rolled out as part of the CFPB's "Know Before You Owe" initiative. Lenders are now required to replace the Good Faith Estimate and HUD-1 with two new disclosures: the Loan Estimate and the Closing Disclosure. In addition to the form changes, lenders also put pressure on lenders to be timely, accurate, and complete when processing the forms. According to the survey, lenders, especially large lenders, seem to be using TRID to their advantage, with nearly one third of lenders, and 44 percent of large lenders, indicating that moving TRID disclosures gave them a competitive advantage. Only 12 percent said TRID hindered competitive advantages. Meanwhile, only 16 percent of small lenders said TRID created competitive advantages for their company.